I love Irish Soda Bread and am always on the lookout for a good recipe. Ever since my first trip to Ireland, where I ate it every chance I got, I’ve been hooked. Pleasingly plain and wholesome, it reminds me of a big biscuit only better because it is lower and fat. And with just four ingredients (flour, baking soda, salt and buttermilk) you can stir together a loaf in minutes. Because it doesn’t require kneading or yeast, simple soda bread is a great introduction to the joys of bread-making. 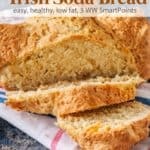 How Many Calories/WW Points in Simple White Irish Soda Bread? According to my calculations each serving has 101 calories, *3 Weight Watchers PointsPlus, *3 WW Freestyle SmartPoints. 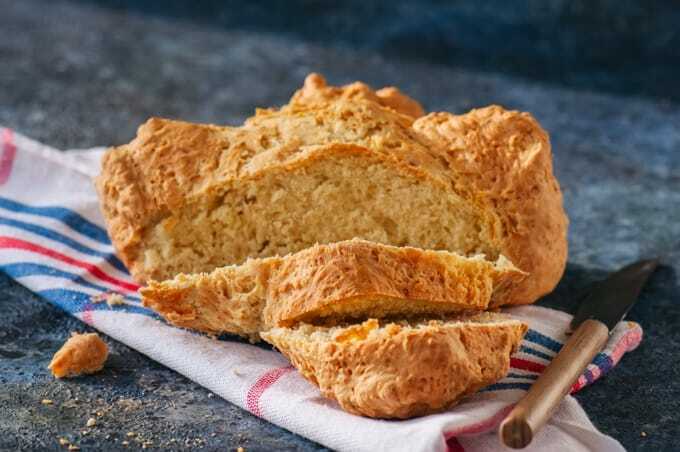 This recipe for traditional Irish soda bread is much simpler than many of the recipes you find here in the US which often include butter, sugar, eggs and/or raisins. 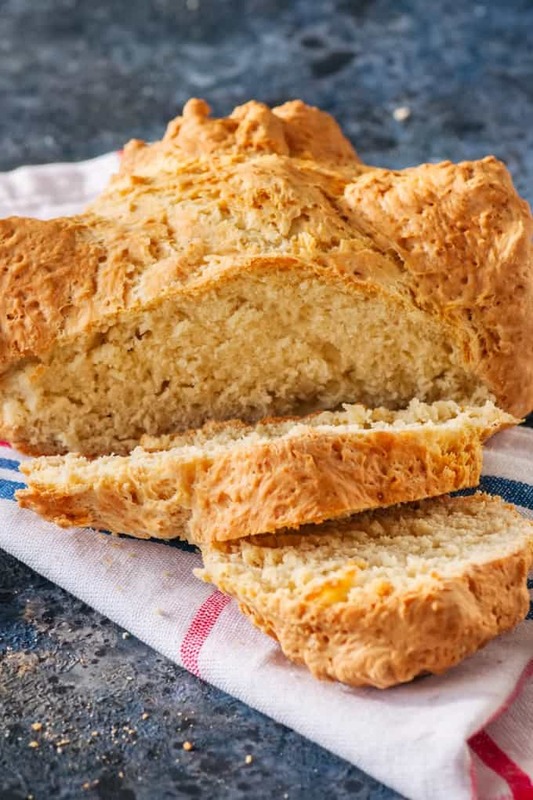 As we enjoyed it both dipped into our soup and topped with soft butter and honey, I silently asked myself why I don’t make Irish soda bread more often since it’s so simple to make and satisfying to eat. I spent more time than I should have today searching the internet for Irish soda bread recipes and came up with several that look like winners including one for Irish Soda Bread Muffins that I can’t wait to try. And here’s a video of Darina Allen, from the famous Balleymaloe Cooking School in Ireland demonstrating how to make traditional Irish Soda Bread. She makes it look so easy! I continue to work on perfecting my Irish Soda Bread Baking Technique. 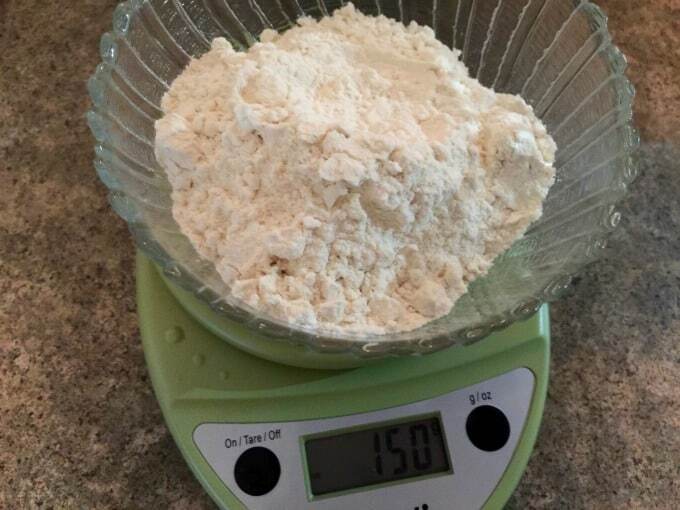 Measure all ingredients accurately, most especially the baking soda. Be sure to use only what is called for. In this recipe 1 level teaspoon. I’ve had much more success baking this bread since beginning to weigh my flour instead of measuring it. When adding the buttermilk to the flour, start off by adding most of it all at once and mix into the flour. Don’t drizzle it in because if you do it will take too long to mix and your bread will be tough. Don’ knead the dough. You just want to mix and then gently shape it. Make sure your loaf is fully baked. It should have a golden brown crust and sound hollow when tapped on the bottom. Traditional Irish soda breads are cut with a knife in a cross shape. This is more than symbolic. The deep cut allows the heat to penetrate the middle of the loaf ensuring that it is properly cooked through. If you don’t have buttermilk, add 1 tablespoon and 1 teaspoon of lemon juice to 12 ounces (350 ml) of whole milk before proceeding with the recipe. It is best to stir the mixture with your hand open like a claw from the sides of the bowl and should come together in a matter of seconds. The dough should be very soft and a bit tacky but not wet and sticky. Add the remaining milk only if necessary. Once it comes together DO NOT KNEAD. Just turn it out onto a well floured surface and with clean hands gently shape into a round loaf about 8-inches in diameter. 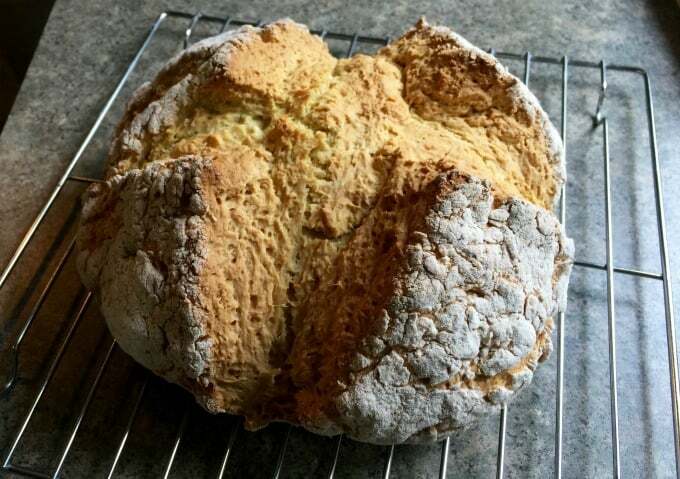 If you’ve made this Irish Soda Bread, please give the recipe a star rating below and leave a comment letting me know how you liked it. I love Irish Soda Bread. It's easy to make and tastes like a big biscuit, but with less fat since there is no butter or shortening in it. Position one of your oven racks in the center and preheat the oven to 450F. Lightly flour an 9-inch glass baking pie plate or baking sheet; set aside. Sieve the dry ingredients into a very large wide bowl. With your fingers or a whisk mix very well. Make a well in the center of your flour mixture. Add most of the buttermilk to the bowl all at once. Immediately with your hand open like a claw, mix the flour into the buttermilk from the sides of the bowl until a softish dough forms. This should take only seconds. You want a soft dough but not wet and sticky. Add the bit of remaining milk only if necessary. Turn the dough out onto a lightly floured surface. With clean hands gently shape the dough into a round loaf shape about 8- inches in diameter. With a sharp knife, cut an "x" in the top about 1/2-inch deep, being sure to go right out over the edges. Place the dough in the prepared dish/baking sheet. Bake for about 15 minutes, then lower the temperature to 400 and bake for 20 to 30 minutes more or until the bread is golden brown and a skewer or cake tester inserted in the center comes out clean or with just a few moist crumbs. The loaf should sound hollow when tapped on the bottom. Remove from the oven and place the bread on a rack to cool completely. This bread is best enjoyed within a day of baking. Once completely cool, wrap it tightly in plastic wrap and store it at room temperature. Buttermilk Substitute: If you don't have buttermilk, add 1 tablespoon and 1 teaspoon of lemon juice to 12 ounces (350 ml) of whole milk before proceeding with the recipe. Note: Some of the descriptions below are excerpted from the recipe sites. Agnes O ‘Sullivan’s Brown Soda Bread Recipe — Irish soda bread is like a bowl of hot cereal to go. It’s moist, nutty, and slightly sweet, with the comfort level of my grandfather’s oatmeal. It makes you feel not only fed, but nourished. Recipe from Tea and Cookies. Darina Allen’s Irish Soda Bread Recipe — Here is Darina Allen’s recipe for soda bread from her book Easy Entertaining: Over 250 Stress-Free Recipes and Sensational Stylling Ideas (affiliate link). Darina runs Ballymaloe, a highly regarded culinary school in Ireland and is the author of several successful Irish cookery books. Found at Greatfood.ie. 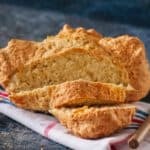 Ideal Irish Soda Bread — By adding egg, sugar, caraway seeds, and butter to a traditional Irish soda bread recipe, you create a loaf that is fit for a Sunday breakfast or brunch. Found at Martha Stewart. Skillet Irish Soda Bread — Baked in a cast iron skillet and served with cheddar and apples. From The New York Times. Whole Wheat Soda Bread — A slightly sweet, craggy, “everyday” loaf, with inspiration from customer Fred B. Dugan. Found at King Arthur Flour. Thanks for visiting my food blogsite. I enjoyed your cookbook story of the lady with much more of an addiction that I have. Too funny. This bread look wonderful. Yum. My first attempt was kind of flat but delicious. I’m making it again.